In a climate with four incredibly distinct seasons, spring is the time to wake up from our winter slumber and turn our outdoor spaces into livable extensions of our homes. We have to enjoy the warm weather while it lasts! In order to beautify our deck and backyard, we painted, spray painted, planted flowers, spray painted some more, planted herbs and so on. There were so many "before" pictures to show you that I decided to create a couple of collages. Otherwise this post would go on forever. 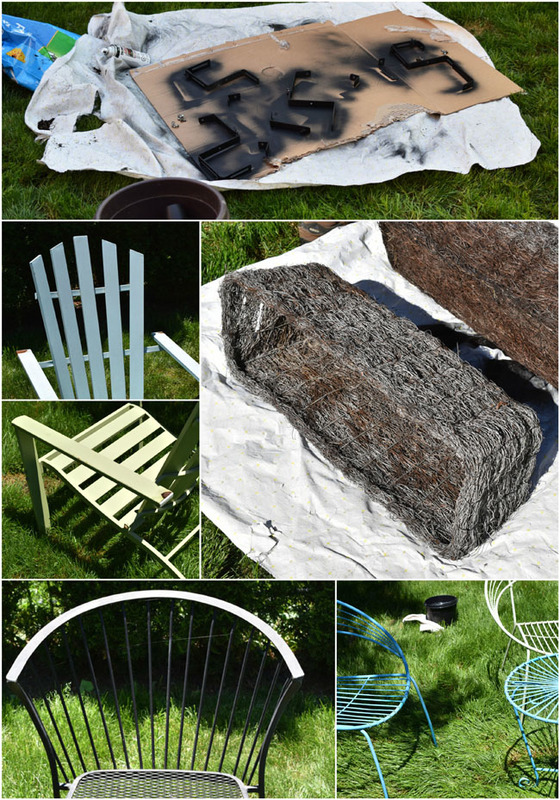 Above, items we had to spray paint, clockwise from top: brackets for the plant boxes that we hang on the deck; the (very faded) plant boxes themselves; two vintage-look round chairs with matching table; one black iron chair (representing four chairs and a table that needed painting); and finally, green and blue aluminum Muskoka chairs (note the rusted areas on the arms). We decided to spray paint the two green chairs and the two blue chairs in colours that are similar to their original, pre-faded colours. I really like this glossy key lime colour from Rustoleum (Ultra Cover 2x). We used Rustoleum's lovely satin aqua for the blue chairs. There were so many projects to work on, we didn't know where to begin. I washed all the furniture first and left it in the sun to dry. My husband worked on some repairs while I started spray painting. One of the window boxes had fallen off the shed at some point during the winter. It lay in the snow and pretty much started to rot. 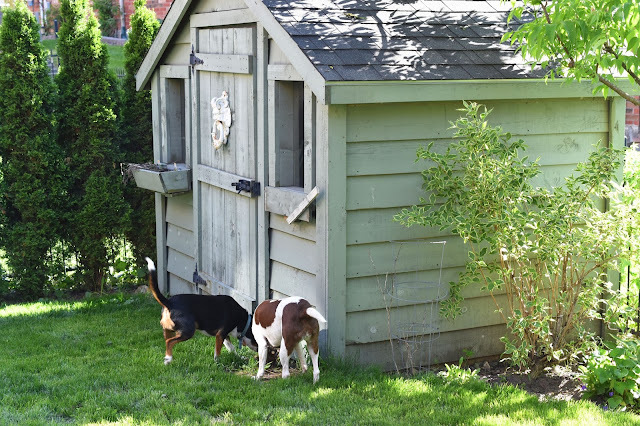 (Just try to get a picture of that shed without dog butts in it! Impossible. There are rabbits under the shed and those dogs are going mental.) I was determined to get another season or two out of those boxes by banging them back together and painting them. 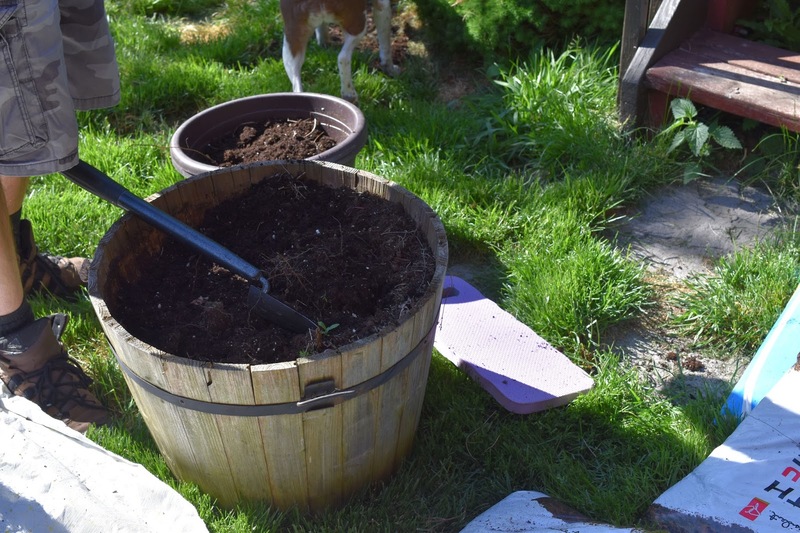 And there were annual flowers to plant of course. We have this large barrel that we always fill, above and a smaller barrel that once housed Christmas greenery. 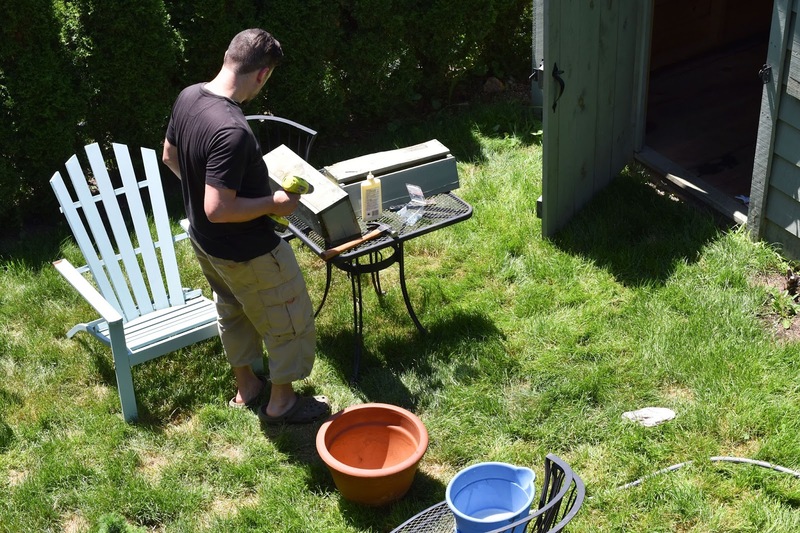 One of my favourite backyard projects was the shed window box overhaul. My husband repaired the planters as best he could. Then I washed them, sanded them and applied two coats of zero-VOC Fusion Tones for Tots paint in Little Star. 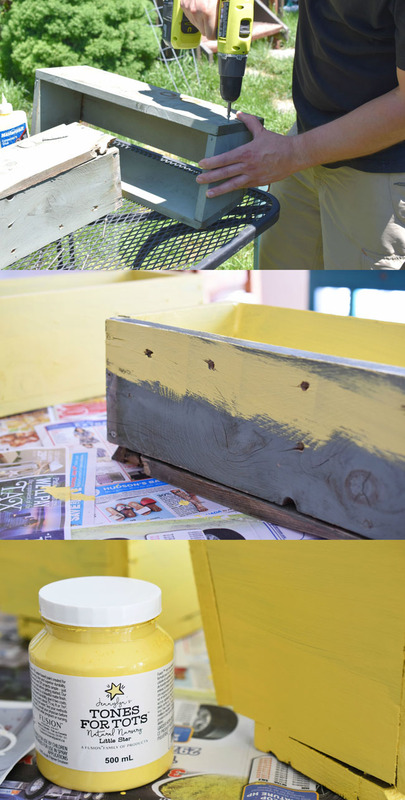 It's such a beautiful, sunny yellow and I was really excited to jazz up the shed with it. I felt all happy inside just painting with this colour. That pretty much summarizes our outdoor space and the furniture and design elements we had to fill it with. Then came the fun part - arranging our newly revitalized pieces back on the deck and in the yard! Let's look at the yard first. When I saw my blogger friend Dannyelle's yarn tassel garland on Life is a Party recently, I knew I just had to make one to hang from the shed! The tassels add a touch of whimsy and a feeling of celebration to the yard. And they are really easy to make. I combined a few techniques that I found by googling. Maybe I'll share a tutorial one day. So far the yarn tassels have survived one heavy rainfall beautifully too. And how about my sunny yellow window boxes? The flowers ain't much to look at yet, but they'll get there. In the meantime, I feel that happy glow again every time I cast my eyes on those boxes. It's the simple pleasures, right? I'm splitting my summer yard tour into two posts. Otherwise this post would get really long. Plus, I feel that I need to go relax out in my backyard now! Stay tuned for the deck reveal. Have you updated your outdoor space for summer 2016? Refreshing our outdoor spaces is a reality of life in Canada. Some people rise to the occasion and do something really beautiful with their space. Like these blogger friends of mine...check it out! It'a funny how we don't notice the forest for the trees sometimes and can ignore how faded some things are with time. A good refresher is definitely a way to stay busy and empty some paint cans anx get to work! 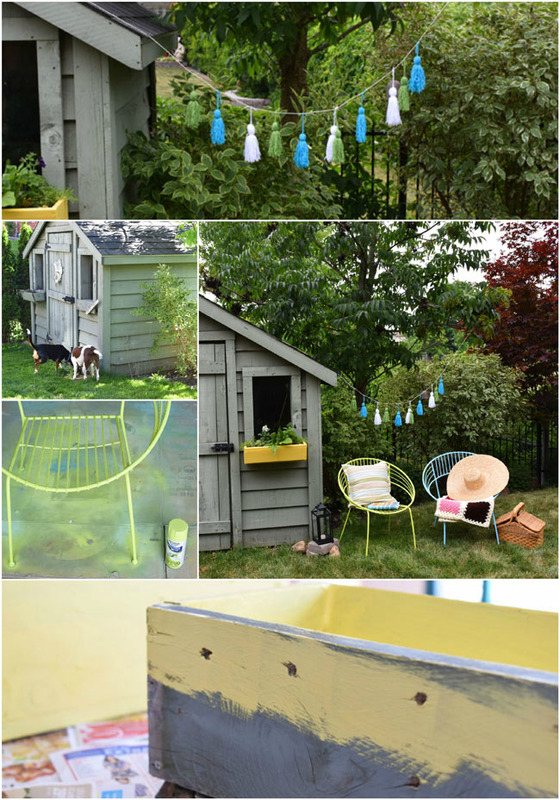 I love the pop of yellow on the shed! It makes such a difference. And the doggie butts make the picture even better.. just as dogs do!! I love the touches that you have - the tassel garland, the afghan tossed onto the chairs - it's such a lovely space! And the yellow Tones for Tots colour is gorgeous. I might have to get some of that! So pretty, and I love your tassel garland. Your garden is so bright and fun, thanks for giving us a peek. Oh I know eh? Can't take a food photo without a nose popping in there! Our garden is not even an option in winter so I understand. We envisioned the shed being a playhouse in summer but it hasn't happened often. I love all of the colour you've added and those yellow flower boxes are the perfect contrast against your garden shed! I hope you get to chill out and read your book without rabbits or puppies interrupting the tranquil setting you've created! And... those tassels are to die for, I need to make some! Thanks Laurie! It's amazing what a difference the yellow boxes make in picking the whole thing up a bit. :) I plan to enjoy that setting really soon. ;) Definitely, make some tassels! So much fun! This is super cute. Love those bright colours and the tassels!